Club Penguin Cheats by Mimo777 Club Penguin Cheats by Mimo777: Club Penguin Estate Igloo Glitch! Oh no! 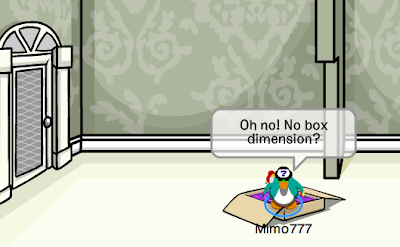 If you put your Box Dimension portal in your new Estate Igloo, it won't let you go in! That can happen in any igloo. Just leave and go back in your iggy and it should work! Hey mimo777 if you go play thin ice it only lets nonmembers go to level 8 and members get to play ALL the way! Mimo, the new rainy background is made only for members but it says background available to all players! glitch on my computer:when i talk to the sensei, it shows that im in the hidden lake! hey mimo why dont you go on chobots or have partys on chobots anymore? you should have one soon. Mimo if you have the split level igloo and get bamboo flooring part of the top level is gone! On the Box Dimension glitch it works in my split level iggy too, and has been going on since early September i guess. I think i thought i wasn't clicking on it correctly till now. i bought the new igloo and when i bought it it didnt show up so then it took my coins too so now i lost 2500 coins and I still dont have my igloo!! Hey Mimo another glitch if you get the bamboo floor in the estate igloo it does not reach the edge at the front! This may work with other floors but not sure yet. Thanks, give me credit for this! thanks mimo! Mimo theres a glitch with the puffle beds you can't put them to close or they go under each other. If you go on igloo upgrades then click on the door of the gingerbread house it opens and closes! sweet! OMG there's lots of glitches in Club Penguin! There's at least 15 comments about glitches! (Each one is a different one) Club Penguin please fix the glitches! Thank for posting my earlier comments, i have done the newest field op witch was in the hidden lake, ( thx for that ) and each time i play a game before it loads just my club penguin and the hidden lake always comes up! Any sugestions! Is that a glitch? can u tell me how to get that portal to go to box dimension? hi mimo777 and cpg mod!